Happy Birthday Eli. We love you, we miss you, and we look forward to the day when we can be together again. will be shining so bright. seem like days to the Lord. on streets made of gold. like a bright morning star. Hello! I just wanted to give some encouragement to anyone who may be feeling lost, who is hurting, or feeling discouraged. Remember: God is ALL powerful and He created ALL things. He spoke us into existence! Place all of your hopes, desires, and fears in God knowing that in spite of troubles we may face, God is in control of our eternal lives. Praise the Father, Praise the Son,and the Spirit in One! So glad I got to be your mom, my beautiful little E.
We want to thank you again for all of the prayers and encouragement you have given. During this difficult time, God has been faithful and we are looking forward to seeing how this ministry can bring more children and families together. Your daddy & I waited a long time to have a family. We prayed for you before we even met you. We had no idea what a wonderful surprise God had planned for us. When we got the call, I was at school and started crying immediately. We were so excited to meet you that we drove 24 hours straight to your hospital. We met you at the hospital for the first time and we loved you immediately. You were sound asleep and your daddy & I held you, stared at you, and were amazed at how beautiful you were. “He’s so perfect,” is all we could keep saying. We couldn’t wait to take you home. These last 3 months have been the greatest times of our lives. You brought us and your family so much joy. You have an amazing love story, Eli. It started when your birth mom loved you so much she let you go. The one thing she told us when we got to meet her was that she never wanted you to think you weren’t loved. She gave you to us because she loved you so much. And then we got to love you. You allowed us to experience love in a whole new way. But no one loves you more than your heavenly father. Our time with you was so short, and we will always want more, but this was God’s plan for you, and we will trust Him and know that one day, we will hold you again. I am so thankful and feel so lucky that we got to be your mom and dad. We were blessed take care of you, and I am glad that we could be the ones to comfort you when you were sick. You had an amazing way of communicating with us by just looking deep into our eyes. We could always see straight through to your heart through your eyes. You were mostly asleep at the end and we didn’t see you awake very much, but for some reason the day of your last surgery, you were awake more than you had been in weeks. You would open your eyes and look right at us. We were so happy to see you awake again and I like to think you were saying goodbye to us and letting us see your beautiful brown eyes one last time. Eli, we are so proud of you, you were so strong and so brave. You amazed all of the doctors and fought so hard. We wish you wouldn’t have had to go through all of that pain, but we know that you now have a perfect body. There are no more needles, no more pokes, no more tubes, and no more surgeries. You are in our hearts and we will think of you and be filled with memories of smiles, coos, cuddles, & love. We have hope because Christ has conquered death. We have hope because Christ died so that those who trust Him would be with Him again someday. Our hearts are broken, our arms are empty and we don’t understand why this could happen, but God is sovereign. He loves us more than we can understand. You will always be our son, our first born, and we will always be your mommy and daddy. Funeral at 11:00 am in fergus falls. viewing on friday at 5:00-7:00 pm. we just heard that, as for right now, we are going ahead with the liver that became available today. 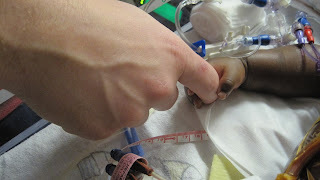 We were told that the other hospital would be taken from the donor at 4:00 am. We are supposed to get some sleep and to be back at the hospital at 8:00 am, which is when everything will get started. Please pray that everything goes well with the operation, that eli is able to keep stable throughout everything & that his body will accept the new organ. Thanks for all your prayers. We may have a liver for eli. One has come available locally. They are doing tests right now and we will know around 5 pm this evening if they will proceed with the transplant. Please pray for strength for eli so that if it happens he will be ready. they are beginning to prepare him and are giving him lots of blood products to help his blood to be able to clot. If he transplanted, it won't happen until around midnight they are saying. We will keep you posted. We are overwhelmed by the love and support we have felt since Eli became sick. The avalanche of cards, messages, and gifts have been a bright spot during very difficult days. Many of you have given us Bible verses and many of you have sent monetary gifts. Many of you have brought us meals, snacks and treats. Many of you have called and emailed us. Some of you have sent praise CD's. Some of you have taken care of details that needed to be done when we left Moorhead so abruptly. Many of you have put Eli on your church prayer chains. Our hearts are filled with your support. We feel the power and strength of your prayers during the day and the long hours of the night. Praying Friends, I talked with Kip for awhile today. Since Saturday there haven't been many wide swings in E's status. They were not able to continue with 24-hour/day dialysis and he has returned to daily 4-hour treatments. Please continue to pray that his kidneys' function would return. He remains on medicine to maintain his blood pressure (Epinephrine). There have been some highs and lows here. 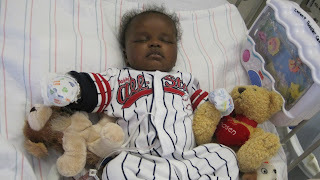 Pray that his blood pressure status would become stable without needing medicine. This would be an improvement. The surgeon pointed out a non-major infection in his abdominal incision. Pray that it would clear. His blood clotting values were more vulnerable today for awhile which caused some bleeding. This may, perhaps, continue until his liver heals. The biopsy results of Saturday have not been reported to them yet. K&C are sleeping okay. Praise God for this! Kip's parents went back to Wadena on Sunday and will return this weekend. Kip said he hopes to begin working from Minneapolis soon. Pray for God's continued provision for their finances during this tremendous journey they are on. Praise God for the many gifts they have already received from those who love them. 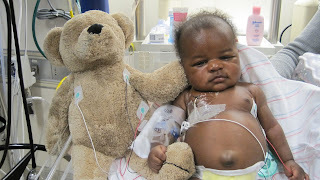 They are continually trying to get Eli more stable, and he is really needing a new liver. The sooner the better! I know we have been asking for a lot of prayer, now we need more! Thank you to everyone who is praying!! we are so thankful that e made it through the night. His numbers are looking much better (there is still a long way to go). His is scheduled to go back to surgery at noon to get his stomach fluid emptied and have his stomach sewn back up. We know that he is doing better because of all of your prayers. 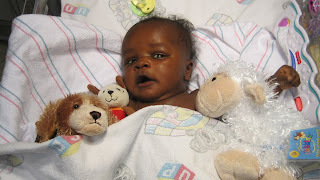 We ask that you continue to lift up our precious boy through prayer as he still is very critical. we are so proud of him. Please pray for 'e' and a probable surgery tonight. !!!!!!!!!!! I am just copying this from Trena's email - some of you may have already read this. First of all, a clarification. 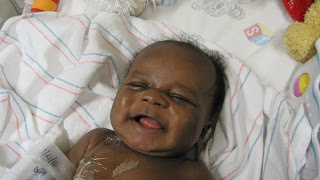 Eli is still on the transplant list. He is just not a candidate for a live donor (i.e. adult) because of his size/age. 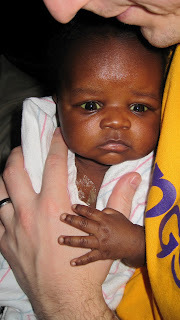 If a baby liver came available that was a match, he would likely go to surgery. 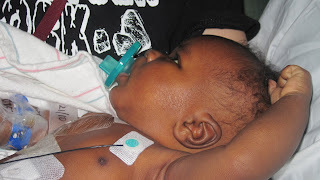 Early today, the IV that was surgically inserted into a big vein inside his chest (Hickman) fell out. They were able to get an IV inserted into his ankle area, but he is scheduled to go into the operating room tomorrow to have that replaced. 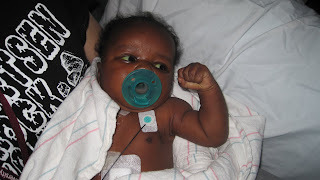 As long as he is undergoing anesthesia, they are going to do another liver biopsy to verify if the results of the first biopsy and to see if any change has occured.. Pray for safety during the procedures and that God would reveal his power (in His will) by having the biopsy show signs of living cells. Cathy said they have had some ups and downs as far as the information they get from their specialists. Just 2 days ago, the liver specialist (gastroenterologist) told them that a liver test result had returned and was indicating to her that there may be some regeneration. However, today, the surgeon and gastroenterologist said that because his blood sugar levels are so erratic, that is an indication the liver just isn't doing it's job and he for sure needs a transplant. So, K&C are trying to avoid the emotional highs and lows and are just emotionally planning on a transplant. I know they are still praying for healing and that is what we all can do as well. He still 'looks good" and is acting like himself. Cat said that Eli's situation is quite rare and so this team of physicians hasn't really seen this aged child in this situation very often. Continue to pray for the physicians and nurses as well as the rest of the healthcare team. So far, we are still in 'wait and see' mode. 'E' is stable and looking good, we will wait to see if his body is able to fight this off! Here are some pictures. The transplant surgeons have informed us that a living donor just isn't the best fit for 'e'. They have asked us to hold off on sending donors to them for now. If you were considering being a donor - Continue to prayerfully consider this as an option. In the days to come - who knows if their opinions will change. 'e' has been so happy to hear about all the people praying for him. We had a fun time playing with 'e' today - lots of smiles and talking. We are now looking for a liver donor (in case there is no baby liver available), the donor now has to be 100 lbs. or under. Pray for Eli. "E" has a new hospital buddy! No new updates - just sharing pictures. 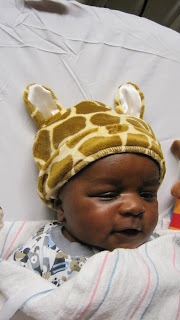 We have been talking with all of the doctors about Eli's almost certain liver transplant. They are looking for a full small baby's liver to use, which would be the best situation. However, there is a possibility that there may not be enough time to wait for the perfect liver to come. In that case we would have to find an adult donor. They are looking for "O" blood type and someone who is less than 110lbs. They think there is a good chance that the transplant would take place within a week. Keep us in your prayers. We were informed this morning that a liver transplant will definitely be needed based off of the preliminary liver tests. The liver looks to have suffered too much damage. 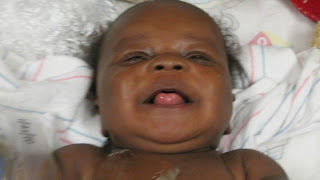 The doctors are extremely pleased with how his body is handling everything (alertness, etc.) - which will help when the transplant occurs. We are praying now that a good, compatible liver (that is the correct size) becomes available - and that the procedure and recovery goes smoothly when the time comes. We are thankful that the rest of his body is so responsive, and that the medicine will continue to keep many of his levels in check. The liver biopsy was performed yesterday (friday). We will see preliminary results today, and more detailed info throughout the week. The proceedure went well with minimal bleeding. We are hoping to get closer to some answers as we see the results. We were also finally able to feed Eli again today with some low protein food. I am sure he loved having something in his tummy again. Please continue to pray for him, as we continue to test and monitor. Thank you to everyone for all of your support through all of this. Thank you for your prayers and support. We are at the U of M Ped ICU. His liver is failing, and they are doing lots of tests to try to find out what is causing it. He is going to have a biopsy in a few hours. 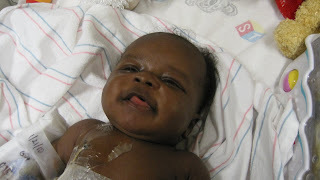 He has been put on the transplant list in case he needs a transplant. K loved to cuddle E! I've had some people ask about E's room, so I took a few pictures. Everything in his room was given to us or borrowed! Here is E chillin in his crib. Thanks mom for the wall hanging! Thanks Alissa for the cute frame! Thanks Holly and Trista for the Elijah letters! Thanks Dave and Sarah for the crib! E's cousin C from North Carolina! We had a great time meeting the M family! Here is my "twin" K with E! Sooo Sweet!! This is E's cousin W. They were born 1 week apart! Here is E's good buddy S. Their mommies are also best buddies!